I like to think Requests is mostly analogous to Werkzeug in terms of purpose, functionality, and goals. One is for servers while the other is for clients. Werkzeug and Flask were huge inspirations for Requests' design. As a matter of fact, Requests contains a decent bit of Werkzeug's internal data structures. So, why are they separate projects? At PyCon 2012 a few weeks ago, Andrey Petrov, Armin Ronacher, Paul McMillan, and myself got into a room for a brainstorming session around the possibility of formally combining our efforts. My expectations going in weren't that high, but that quickly changed once we were all in the same room. We discussed the general state of Python HTTP, security concerns,distributed services, and web application testing. 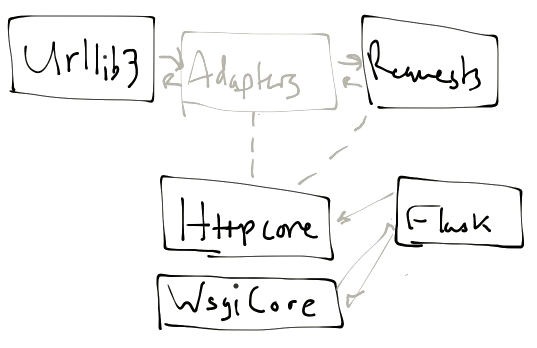 Today, making real HTTP Requests to an in-process WSGI app with a real HTTP client is not simple. Can you imagine writing real OAuth tests for your application with the same HTTP consumer your clients will use? The root of the problem is that WSGI doesn't map 1:1 to HTTP. So, instead of taking the WebOb approach of using WSGI as the common protocol between services, why not use HTTP itself? The rest of the world uses HTTP as the most-common denominator after all. Consolidate shared code between Requests and Werkzeug into a new httpcore module. Move WSGI-specific Werkzeug code into a new wsgicore module. Make HTTP (vs WSGI) the common protocol between services. Provide a transport adapter mechanism for mocking and emulating HTTP services. Requests, Flask, and Werkzeug will remain the same to the end user. Behind the scenes, the same functions used to generate a request will be used to consume it. For example, stream handling, header parsing, and form-encoding will all be synchronous functions from httpcore. Transport Adapters will provide a mechanism to define interaction methods for an "HTTP" service. They will allow you to fully mock a web service to fit your needs. """Takes a Request object, returns a Response object.""" # Whatever needs to happen here. HTTPCore will be comprised of the code currently shared by Requests and Werkzeug, general HTTP utilities, and base objects / data structures. In addition to testing web applications, this new Adapter system will provide a fantastic mechanism for distributed services. In Requests, you'll be able to mount external services to the routing mechanism bymocking HTTP. To Requests, it'll be an HTTP Service, but in reality the service could be anything: a random number generator, ZeroMQ socket, proxy, WSGI application,&c. Requests will be able to use the same cache backends for HTTP Requests that Flask/Werkzeug does for views. They will be moved to cachecore. Security enhancements (e.g. DNSSEC) can live in httpcore rather than waiting for a PEP or standard library implementation. Django could potentially utilize the security features provided by httpcore. Django/Flask could potentially use Requests as their respective official test clients. If you have thoughts to share, feel free to discuss this with us on Freenode at #cores.